The compact Studer Vista 5 SR digital mixing console is a road-ready version of Studer's famous Vista 5 console and combines award-winning Vistonics-based technology with a highly cost-effective price. The Vista 5 SR comes with preset configurations for front-of-house and monitor use. A stand-alone Config Editor tool allows the channel/bus structure to be customized, all of which can be saved for each particular show setup and instantly recalled from memory or a USB stick at a later date. The expandable I/O system allows the entire range of available Studer D21m Series I/O cards (including CobraNet and Aviom A-Net) to be added to the system. The MADI standard is used as optical snake link from stagebox to FOH rack, with the possibility to add a redundant snake for increased security. The Vista 5 SR also comes with numerous facilities to aid production, including Studer’s proprietary VSP panning system, which can be used to great effect to control panning without level shifts. 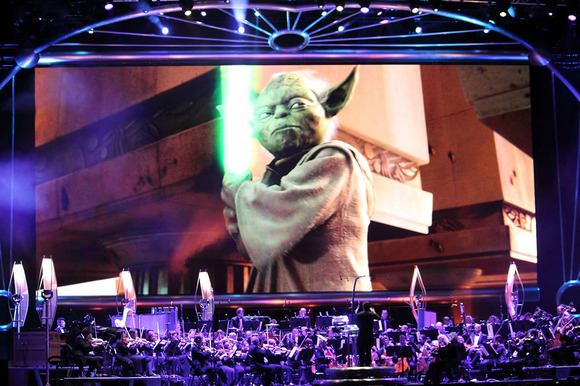 Other members of the sound crew on Star Wars: In Concert include: Matt Fox, PA Crew Chief; Patou Lemay, PA Systems Tech; Jeremy Walls, PA Tech; Hilario Gonzalez, PA Tech; Greg (Chico) Lopez, Stage Sound Tech; Richard Morris, Stage Sound Tech.